Unaware of the tragedy awaited later on, I sauntered through Burlington Arcade towards Old Bond Street. It was almost 6pm and the street lined with opulent show windows was shimmering in the warmth. 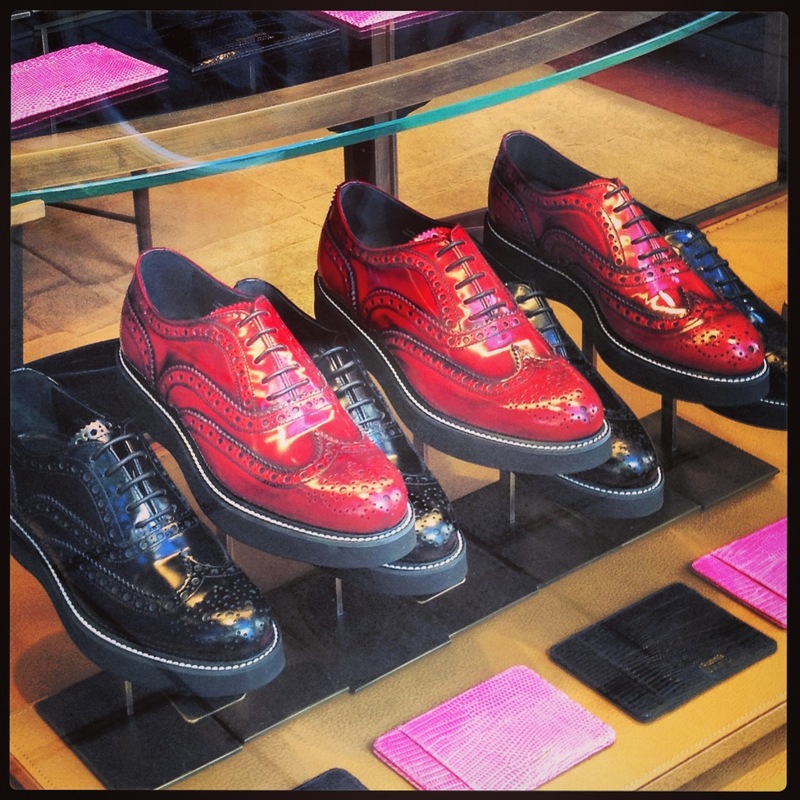 I assure you that I wasn’t there to buy any jewellery (I wish) but to take my beloved brogues to Church’s on Old Bond Street. 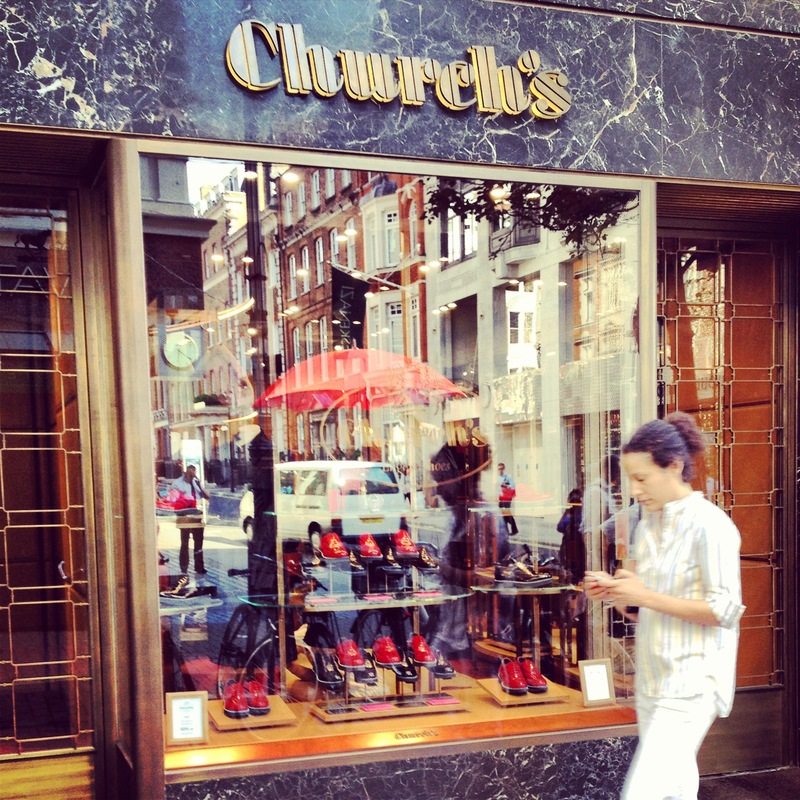 This small but chic branch is totally dedicated to ladies shoes and accessories. The boutique is manned by friendly staff who is happy to dispense useful tips on how to keep Church’s footwear in a top condition. I brought my black Burwood which I smeared with too much shoe polish. The staff inspected the pair and suggested to leave it with them so they could give a thorough makeover – stripping the piled on polish and reapplying shoe polish in a correct way. Wow! They look like Dr.Martens, don’t they? Mmmm… I may try them on when I collect my Burwood next week. By the way, about the train crash in Spain, isn’t that terrible? If the claim in newspapers is true that the train was derailed because the driver was going over the speed limit deliberately, he is no different to a murderer. He was in charge of so many innocent people’s live. Yet, his lack of judgement and apparent no sense of responsibility resulted in this catastrophic consequence. How ridiculous! It’s only my personal experience but I had a “heart in a mouth” moment twice during my holidays in Spain. The first one was in Barcelona. I hired two cabs with a group of friends. Once we hit the road, the drivers decided to race with each other. While we were screaming with fear and begging them to stop, those two idiots slammed their feet on accelerators and carried on having a fun. Eventually our ordeal ended at our destination. Then, they demanded an extra tip because they ferried us quicker than usual. We didn’t know enough Spanish to settle the difference of opinion, so had to hand over more cash gingerly. The second one happened when my long-distance train was terminated unexpectedly and all passengers, including me, had to be transferred to the next station by bus. It was already passed midnight. We were herded up and told to get on board the buses which were waiting in a row. Once the buses were filled up with hapless passengers, the convoy started. But oh my, it was one hell of a ride. The driver drove like a man possessed through rocky rugged mountain road. The route he took seemed to be full of hairpin curves and rapid ascends & descends. The road was unlit and the only light source was the headlamps of the bus. I might have felt a little better if the journey were done through daylight. At least, I could see where we were heading and know when to brace myself for jolts! The light swung left to right like a frantic searchlight and heightened the sense of speed. All the sudden, a quarry like rocky side wall came in a full view. The harsh lighting made the texture appeared even more rugged which amplified my fear. In both occasions, no physical harm was done to me. However, all professional drivers should offer not only a safe but also comfortable ride to their passengers. No passenger should fear for life at any moment in the backseat. Therefore, those Spanish drivers I encountered were no better than any joyrider, in my opinion.